Product of Koenig Maschinen Gesellschaft m.b.H. Choose recipient ...Koenig Maschinen Gesellschaft m.b.H.Franz Sommerauer Please choose a recipient. The Roto Passat from König is a compromise without compromise: Maximum performance is offered in the smallest of spaces. 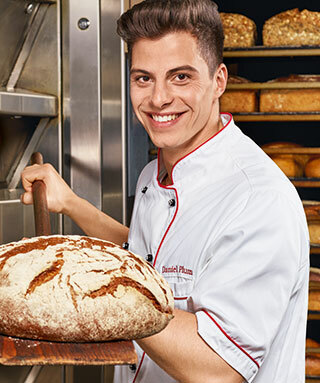 The proven technology ensures the best, uniform baking results. The well thought-out design for an incomparable ratio of baking area to storage area: none is smaller! And - one for all: the Roto Passat is designed for the complete product range. From rustic bread to biscuits and pastries to confectionery. Very well suitable for half-baked goods. When developing the new "SE - save energy" version of the Roto Passat, the main focus was on "energy efficiency". Compared to its predecessor, this stove offers potential savings of up to 20%. A newly developed heating coil is the basis for this energy reduction. The heating coil, which is operated according to the countercurrent principle, now offers significantly higher efficiency and better heat transfer. König's Roto Passat is available with a gas or oil burner and as an electric stove. The modern design, the thoughtful construction and the simple control with touch screen screen make it an easy to operate and maintenance-friendly universal furnace.